The five books of the Pentateuch (Genesis, Exodus, Leviticus, Numbers, and Deuteronomy) are foundational books of the canon. Without at least some understanding of the teaching of these books, it is next to impossible to understand fully the remaining books of the Bible. It is in these books that we learn of God’s creation of all that exists, the creation of man, the origin of sin, the Abrahamic covenant, the origins of Israel, the exodus, the Mosaic covenant, the law, the priesthood, the blessings and curses associated with covenant obedience and disobedience, and so much more. The remaining books of the Bible assume the reader’s knowledge of these things. The historical books, for example, tell the story of Israel in light of her obedience or disobedience to the stipulations of the Mosaic covenant. The prophetic books warn Israel that disobedience to the stipulations of the Mosaic covenant will bring judgment and constantly allude to events in Israel’s early history. The New Testament begins with the words, “The book of the genealogy of Jesus Christ, the son of David, the son of Abraham” (Matt. 1:1). But who is Abraham? The answer to that question is found in the Pentateuch. If we would understand the Bible, we must begin by understanding the basic teaching of the Pentateuch. For those seeking such understanding, help is available in a number of resources. One such volume is the new second edition of T. D. Alexander’s From Paradise to the Promised Land: An Introduction to the Pentateuch, published by Baker Academic and Paternoster Press. T. Desmond Alexander is presently the director of Christian training at Union Theological College in Belfast, Northern Ireland. From 1980 to 1999, he was a lecturer in Semitic studies at the Queen’s University of Belfast. He is also the author of the commentary on Jonah in the Tyndale Old Testament Commentary series and the co-editor of the Dictionary of the Old Testament: Pentateuch and the New Dictionary of Biblical Theology, all published by InterVarsity Press. 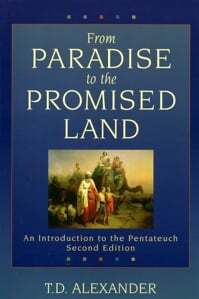 The first edition of From Paradise to the Promised Land was published in 1995 and focused exclusively on the contents of the five books of the Pentateuch. The new second edition has added several chapters discussing contemporary studies of the Pentateuch. As Alexander explains, “The present volume, therefore, seeks to (a) guide the reader through the maze of modern approaches to the Pentateuch, and (b) focus on the main themes of the Pentateuch, viewed as a unified literary work…” (p. xii). The author has succeeded admirably in his goal. The new additions to the book are found in Part One, which is titled “Pentateuchal Criticism.” Alexander introduces the reader to source criticism, form criticism, Traditio-historical criticism, as well as literary criticism. Much of part one is devoted to a discussion of the well-known Documentary Hypothesis. Alexander traces the rise of this theory, and explains some of the many criticisms that have been raised against it in recent years. For many readers, the content of Part One may seem superfluous or even irrelevant, and the temptation may arise to skip directly to Part Two. However, even for those who are not pastors or seminary students and who are not regularly involved in scholarly discussions of this type, familiarization with the content of Part One is well worth the time and effort. The kinds of criticism examined in Part One, and particularly the Documentary Hypothesis, have shaped the study of the Pentateuch for over a century. Those who are informed are better equipped to detect when these ideas are negatively affecting the content of books or sermons. Part Two of the book provides an overview of the content of the Pentateuch by focusing on its main themes. After a brief overview of the Pentateuch (pp. 97–100), the content of the book of Genesis is examined in four chapters under the thematic headings: “The Royal Lineage in Genesis,” “The Blessing of the Nations,” “Paradise Lost,” and “By Faith Abraham…” The book of Exodus is covered in four chapters under the headings: “Who is the LORD?,” “The Passover,” “The Covenant at Sinai,” and “The Tabernacle.” The contents of Leviticus are discussed in three chapters under the headings: “Be Holy,” “The Sacrificial System,” and “The Clean and the Unclean Foods.” Numbers is covered in two chapters: “Towards the Promised Land,” and “Murmurings.” Finally, two chapters are devoted to a discussion of Deuteronomy: “Love and Loyalty,” and “Why Israel?” In addition to a discussion of these major Pentateuchal themes, each chapter also concludes with a section titled “New Testament Connections.” This section shows how the Old Testament concepts discussed in each chapter relate to the doctrines and practices of the New Testament. Alexander’s book is particularly helpful in showing the way in which the various Pentateuchal themes develop in these books and into the New Testament. He offers numerous exegetical and theological insights, and through it all the unity of the Five Books of Moses shines through. Alexander has provided the church with an invaluable guide to the Pentateuch. Whether you have read the Pentateuch numerous times or have decided to do so for the first time, From Paradise to the Promised Land is highly recommended.